Dinton Pastures 10km Race 3, the third race in a series of four. 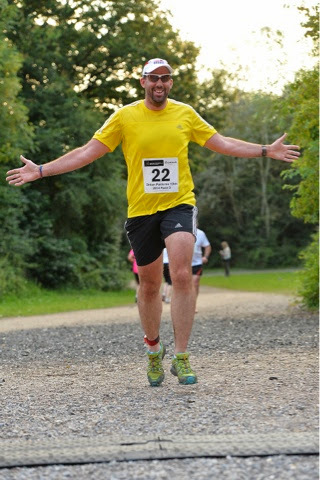 A very pleasant two loop 5km course around the Dinton Pastures country park near Wokingham. I've enjoyed the previous two races and was looking forward to race three. I just wasn't sure how my legs would be after the weekends double marathon. Still, I decided to push it and see where I got. Legs felt strong, but it was warm. I decided to try and pace around 8.40 min/miles. Nothing spectacular but steady. I also decided to run in my Salomon Speedcross 3s. This might not seem anything to exciting, but after running in Adidas Adizero Adios 2s, the Salomons feel rather heavy in comparison. With the NDW100 coming up, it would be good prep. After a little chat with Karen, we were off. The field is a mix of 5km and 10km runners, no more than 300 overall. It soon spreads early on with plenty of room to run. What I always find interesting, is when I overtake runners or get overtaken, am I in a race with them or is it a 5km runner. Going through the first lap, you soon realise as naturally the 5km runners stop. I went through halfway at 27.04, a bit quicker than target. It being so warm I took the opportunity to stretch the legs while getting some water down. Then get back on it. A few times I considered walking and tried to justify it by telling myself I ran a double on the weekend. Poor excuse really. So I pushed on and finished in 54.44. Steady pacing. Comfortable and the legs felt strong. I knew I could've pushed harder, but that push is for another race on another night. This was about a solid safe performance. My natural pacing is working well and I feel I'm starting to get back to my best. After the NDW100 is out of the way, I shall work very hard towards a new marathon pb. With only one race left of the series, there is now a league table of the series runners. I'm sitting in 11th in the Men's Senior table, just 44 secs behind 10th place. I have a target. Although only a few days hopefully after a successful 100 mile finish, who knows? ?